Does anyone have any opinions on the Chris Pitts mini 565? I understand the carbon mast is broken, and the keel is cracked and likely needs replacing. I’m not afraid to tackle either of these problems. Before the boat was damaged was it any good? Is it worth the effort? How would I best transport the boat across to the west coast? Does anyone have recommendations on a good boat transport company? Looks heavy to me, could probably be lightened slightly. Still an old design. No idea on how good it can actually be. You will need a road trailer or a boat transport company. It heavily depends on who is available in your area or around Kingston, RI. Rebuilding The Unofficial Minitransat Website. I am driving down to check this boat out this weekend and will take more pics. If anybody has questions or specific requests, let me know. As to transport, Uship.com is basically the ebay of shipping, and I've had good luck with them in the past. She's rough. I'll upload some pics when I get home, but basically the yard owns her now...an English gentleman had been daysailing her before he had her pulled...he was planning a move back to England and asked them to help him sell the boat. During a move, the boat shifted in the slings. Her keel (metal framework? with wood and carbon) needs to be completely rebuilt. 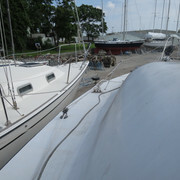 A stanchion is all bent resulting in damage to the deck, and her mast is snapped. What's especially confusing to me was that the "carbon" mast was actually a solid wooden spar with an outer carbon shell. She's tubby compared to other minis I've seen, but oh my! I don't think you'd find more room down below...she's cavernous. Cockpit, not so much. I'll get some pics up early this week for anybody interested. She's been for sale at least two years...they're asking 4900 and it includes unbolting keel and loading it on to your trailer as well as a (larger) aluminum mast...the broker threatened to put the boat in the dumpster and sell sails and instruments for more than asking price, but the elecs are outdated and the sails are boutique...my thoughts are if they were going to do that, it would have been around the time they bought the boat by breaking it. I have more pictures of the inside and whatnot if anybody is interested further. 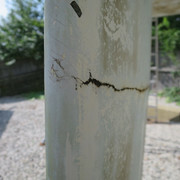 The keel appears to be carbon over wood and would need to be completely replaced. The aluminum mast is what the yard is selling with the boat to replace the wood one, although it it a bit bigger than the carbon/wood one that it is meant to replace. 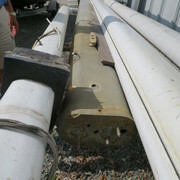 The mast isn't really wet, but broke instead because of the massive amount of hardward that was placed at the spreaders. It seems as if it was only a matter of time. I am not sure if this is the original mast or not. Thanks for having a look and posting a report. I don’t think she sounds like a suitable project for me. No problem at all, glad you got the PM. There are a couple on the west coast for sale via sailboatlistings if you're budget allows. Best of luck in the search. about to buy this, wish me luck! Does anyone know what the keel design is like, guessing it's stainless rods to the bulbs surrounded by wood with a carbon coating? Good luck! If you'd seriously like to buy this, I am happy to elaborate as to the construction and repairs necessary. It is not stainless. PM me contact information and I'll send you everything I have. Ah sorry, by all means go for it, just seemed to have been there for a while, seems a waste and was looking for a project, am stuck in thrunderbolt marine in Savannah for 4 months so was going to bring her here... any info you have would be great though. Thunderbolt?!?! Gotta love those 6 Krispy Kremes and the paper every morning!